In the interests of national prosperity, in a near-future Japan all children are given an inoculation on their first day at school. One in every thousand of the injections contains a lethal nano-capsule, which will end the recipient's life some time between the ages of 18 and 24. 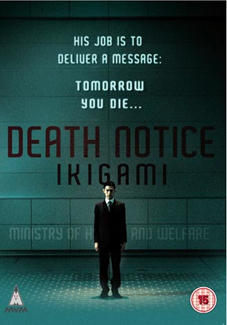 Having been randomly selected to die, prior to their termination these citizens are given 24 hours' notification of their impending doom in the form of an "Ikigami," a death notice allowing them one final day to say goodbye to loved ones and to come to terms with their fate. Among those civil servants tasked with delivering the death notices is Kengo Fujimoto, a young man who secretly harbours reservations about the National Prosperity Law but who dares not speak out for fear of being charged with "thought crimes" against the state. Kengo's moral dilemma regarding the law compels him to breaking the rules of his job by becoming emotionally involved in the lives of the first three people to whom he delivers an Ikigami: a struggling musician who finds fame at the cost of his greatest friendship; the reclusive son of a politician running for office on a campaign that unreservedly supports the National Prosperity Law; and a debt collector whose financial situation is about to become stable enough for him to take his blind sister out of an orphanage and support her himself. Kengo's intervention in the final moments of the lives of these three people has a profound effect that leads him to question everything he has been taught to believe. But what is the cost of change? Directed by Tomoyuki Takimoto (The Investigation Game), based on the best selling manga series written and illustrated by Motoro Mase, and sharing thematic elements with Logan's Run, Battle Royale and 1984, Death Notice: Ikigami paints a vivid and troubling portrait of a dystopian future Japan in which citizens are routinely killed, by law, "for the good of the nation." Death Notice: Ikigami (cert. 15) will be released on DVD by MVM on 7th March 2011 at the RRP of £15.99.